Percy and Queenie don't like Nice Cup of Tea and a Sit Down. Queenie objects strongly to the fact that Nicey's wife is referred to as Wifey, while Percy dislikes their twee Englishness and their insistence on treating everything English as better than everything foreign. When the website was the only thing anyone could come up with to counter Percy and Queenie's accusation that the Internet was nothing but an American colony in cyberspace, Queenie and Percy became quite irate. And to a large extent they were right. Perhaps I should have mentioned the BBC websites instead. For all that the book of Nice Cup of Tea and a Sit Down has its flaws (not the least of which is that its hardback form requires two hands to hold it, making it a less than ideal book for browsing while you're having said ncot and a sd), it does contain some interesting facts about tea and biscuits and hydrogenated fats and shortening and where biscuits have gone to that we all remembered from when we were young. On the whole, though, its faults outweigh its virtues, really. A small point for some, but for me it's annoying to see them talk about Kimberleys as a peculiarly Irish biscuit which can't be bought anywhere else, while failing to include them in the section on foreign biscuits, because after all, Ireland's not really foreign, is it? 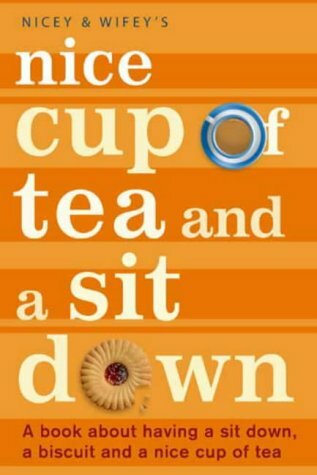 There are some lovely turns of phrase in the book, and an obvious and genuine affection for the national pastime of sitting around drinking tea and eating biscuits. It's a social option that seems to have gone out the window among my peers in the last ten years or so. Time was, when we were poorer, that it was perfectly acceptable to drop round your mate's flat during the day on a Saturday with a packet of chocolate HobNobs and expect to get through a couple of pots of tea before heading home. Now everyone feels they have to either provide lashings of alcohol (which is a pain for me because I'm always driving) or they have to make dinner, which is a pain for them because it involves a lot of work. The best thing about this book is that it reminds you that there are simple and relatively inexpensive pleasures in the world. Shame that this book isn't really one of them. You do realise (the book refers to it quite a bit) that Wifey is Irish and Nicey was raised in Wales? Twee Englishness? I think not..
Percy and Queenie hang their head in shame. They were more going on the annoying Life in the Day article they read in the Observer about Nicey and Wifey than any in depth analysis of the website. Although they had clicked on the website. It must be said thought, that they don't like Badly Drawn Boy either - the musical equivalent of A Nice Sit Down. Ah, you need a Scottish friend. We have a Scottish friend who scruples not at dropping round and drinking his way through a pot or two of tea, biscuits and all. I think I need to live less than 30 miles away from all my friends. Or get to know my neighbours better.